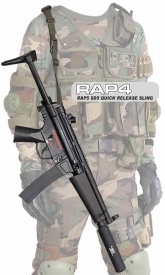 The Quick Disconnect Sling™ (QDS) can be used with all paintball guns, markers, pistols, rifles and sub-machine guns. The QDS has a two-end strap that can be adjusted to fit any users configuration. The QDS is hooked to the shoulder ring of the vest. With this hook type system users can rapidly disconnect their gear from the harness. The QDS give the user a quick and simple way to deploy their gear and to be ready for action at a split second.